Willis Group is a global risk adviser that works with companies that want to become resilient to threats, including those created by extreme weather. Willis wanted to tell its story of ‘resilience for a risky world’ in a manner that would impress clients, inspire the public and galvanise 18,000 staff in 400 offices worldwide. The Willis Resilience Expedition to Antarctica was led by teenage explorer and climate change campaigner Parker Liautaud. It consisted of a 1,800km crossing of Antarctica gathering ice samples from untouched parts of the polar plateau and a 560km, coast-to-pole speed record attempt on foot from the Ross Ice Shelf to the South Pole. Central to the comms was a daily online TV show, exploring business-critical environmental issues, broadcast from a studio built at Willis UK. The expedition attracted coverage on the BBC, Sky News, CNN, and on ABC’s Good Morning America, and a total estimated reach of 665 million people. On social media, there were more than 8,000 Facebook posts, 1,400 mentions on Twitter and 72,000 views on YouTube. In addition to a significant increase in new business enquiries, Willis says it saw a double-digit increase on existing client revenues following the output. Willis Resilience Expedition Summary from Captive Minds on Vimeo. Joshua King is senior vice-president, global comms and corporate affairs at First Data and held a similar position at Willis Group. "Later this month, Willis Group, the global risk adviser, will publish a book called Exploring Extremes: Building Resilience for the Future, a combination of opinions, essays and travelogue of our fragile planet. Much of the book’s action unfolds in Antarctica, the southernmost place on Earth. Many people (including PRWeek) are publishing tracts these days on climate change. Insurance brokers? Not so much. For most of its modern history, Willis banked on the traditional toolbox of communications – news releases, interviews and speeches – to project its message. For a company that prides itself on offering clients 'resilience for a risky world', the book itself is the payoff on a risky bet on the future of PR. It’s a perennial puzzle for corporate communicators. How do you tell an important story when you don’t control the channels of distribution? Answer: create your own. You didn’t always need to. In the 1990s, when I worked in the White House overseeing presidential events, my job was akin to a movie producer. I enlisted the actors (the lead was the President, the supporting cast changing every day), worked with the screenwriters (they’re called 'speechwriters' in politics) and designed the sets (there’s nothing on the South Lawn). The only elements we didn’t direct on our daily location shoot at 1600 Pennsylvania Avenue were lighting, cameras, editing and distribution. But if we delivered a compelling story to fill a news hole, we could rely on the networks and newspapers to make our content shine. The networks put their cameras where we spotted them, and they footed the bill for flattering lighting. The still photographers took their shots from positions we roped off. The end product was a package leading the newscast or a photo on the top of the fold of the daily paper. You needn’t quiz Barack Obama or his advisers if this process still prevails (it doesn’t). But one statistic that can’t be erased from Obama’s legacy is his perfect 2-0 record in presidential elections. His team’s skill at telling his story through owned visual content is one reason why. Obama's 2008 campaign was the first to employ a full-time videographer, Arun Chaudhary, who later brought his camera to the White House and created 'West Wing Week', a five-minute narrative reconstructing how the President spends his days. As tough as critics are on Obama, West Wing Week keeps telling his story with owned news. Herein lies a lesson for the insurance broker and other global businesses rarely covered by the media or seldom for their positive contribution to thought leadership: tell your own story. In 2013, when I was leading communications for Willis, we easily defaulted to the traditional toolbox: crafting releases, scheduling interviews and planning speeches. We blogged and tweeted our share, but it wasn’t enough. Our content was undifferentiated from our competition, and often lagged behind it. 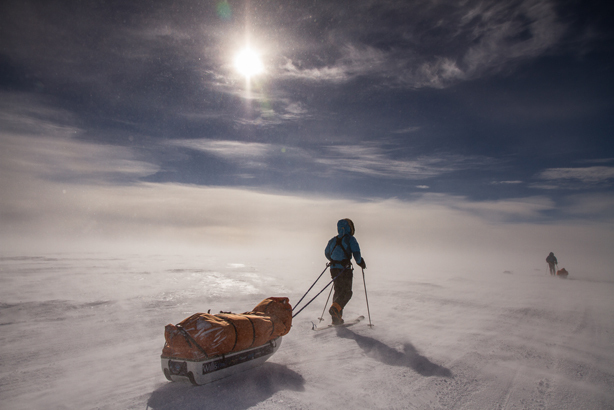 One day, a 19-year-old Yale sophomore, Parker Liautaud, walked into my office with an audacious goal: he wanted to break the speed record for an unsupported walk from the coast of Antarctica to the South Pole and conduct climate research along his route. He needed money for training, supplies and travel, but we saw a bigger ‘win-win-win'. We could help Parker safely make his journey. We could tell our story in new ways on our trademark topic of ‘resilience for a risky world’. And, if we did it right, we could genuinely entertain a world of interested viewers who thought brokers duller than dirt. Guided by a boutique London agency, Captive Minds (for which I’ve since become an adviser), we created the Willis Resilience Expedition with its young hero, distinct branding and multimedia chronicle at willisresilience.com. Tracking Parker’s every move was a custom-built satellite-equipped Toyota Hilux 6x6 that we christened the 'Ice Broker', staffed with a videographer and a correspondent. The intrepid crew embarked in the footsteps of Scott and Amundsen but, unlike their forebears, beamed live video to a high-def TV studio we erected in the lobby of our London headquarters. Throughout December 2103, we produced a daily one-hour TV show with top news talent and a range of experts on climate change. The show reported on Parker’s progress across the Antarctic continent and the Ice Broker beamed him live from the frozen tundra. Beyond tracking this feat of human resilience, each episode shone a light on a different angle of resilience for a risky world: how to build better buildings, fix ageing infrastructure and feed a hungry planet, to name three. The mix of quality entertainment and brand-driven content continued, day after day, until Parker reached the South Pole. On Christmas Eve, after slogging 18 days, four hours and 43 minutes, with 506km under his feet, Parker reached his objective, frostbitten but unbowed. Willis had achieved its objective, too. Parker’s journey had been covered by worldwide media. His youth, ambition and perseverance, tested to the extreme by the Antarctic elements, galvanized the company’s employee population. As the website told his daily story, the new Willis tagline, ‘resilience for a risky world’, captured our clients’ imagination. Now, a year later, Willis remains engaged in the important dialogue on climate change, illustrated most recently by the publication of Exploring Extremes. The book tells Parker’s dramatic story of resilience and adds important other voices to one of the most challenging issues of our time. The subtext is important, too, for current and future leaders in corporate communications. The traditional toolbox is fast becoming fossilised in ice. Companies need to explore their own extremes to tell their own story."